The runners make their way towards Foyers having passed Whitebridge. 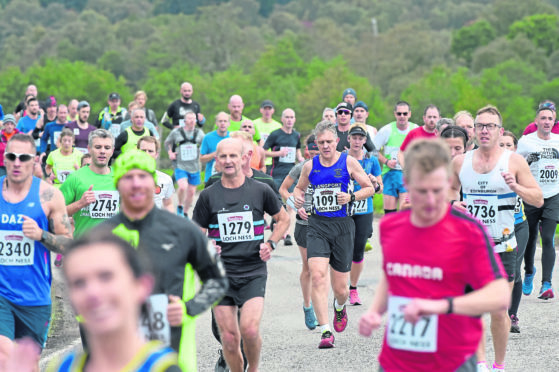 The 17th annual Baxters Loch Ness Marathon and Festival of Running attracted thousands of spectators on what was a windy, sunny and wet day of events. A total of 8,000 runners registered for all events including the River Ness 10K, the 10K Corporate Challenge, the River Ness 5K and Wee Nessie events. Renowned as one of the most scenic marathons in the world, nearly 4,000 competitors from as far afield as Africa, Australia, Germany and France travelled to the Highlands to participate. The route takes runners from the start on the General Wade Military Road, which runs parallel with Loch Ness, via Foyers and Dores and into Inverness as far as Bridge Street. From there runners doubled back after crossing the River Ness towards the finish line at Bught Park. Jordanian, Mohammad Aburezeq, from Altrincham and District Athletics Club crossed the line in two hours, 22 minutes and 56 seconds as the first male runner while Sheena Logan, from Fife Athletics Club, was the first female to finish in a time of two hours, 51 minutes and 11 seconds. The oldest runner to take part in the marathon was Canadian, Roger Macmillan, at 80 years old – who was competing for the eighth time at Inverness, but marking his 110th marathon event. Race director Malcolm Sutherland said: “It has been fantastic to welcome the many thousands of runners, new and returning, to the Highlands for a weekend of spectacular running. “The atmosphere at the Event Village in Inverness and spectator encouragement supporting all of our runners has been unprecedented, it’s an incredible achievement to complete a marathon and we’d like to congratulate everyone who took part. What did the runners think? Erin Simpson, 33, an administrator, and Samantha Simpson, 32, project engineer, both of Stonehaven. Keith Thomson, 50, Nairn, European financial controller. Dwayne Badh, 34, Aberdeen, maintenance superintendant. Billy Gibson, 42, Dundee, nurse. Louise Shepherd, 31, NPD technologist. Helen Endle, 28, primary school teacher.